Paramount Pictures wanted a tie-in game for the new Star Trek movie, and asked Namco Bandai to make it so. The Trekkies out there in the audience know about the odd-numbered curse, right? If not, it goes something like this: The even-numbered Star Trek movies (like The Wrath of Khan or First Contact) are generally much better than their odd-numbered counterparts (like The Final Frontier, or, again, The Final Frontier). This curse, however, doesn't seem to apply to Star Trek video games, which can't seem to attain a 50/50 success rate on their best days. 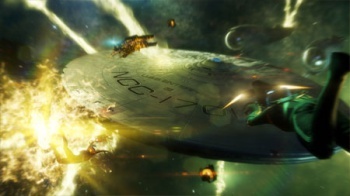 Nevertheless, with a new movie on the horizon, a new Star Trek game can't be too far behind, and this time, the role of developer falls to Namco Bandai. Star Trek - The Video Game will give players cooperative control of Kirk and Spock as they bridge the gap between 2009's Star Trek and its upcoming sequel. Considering that the game is currently in pre-alpha, it's too early to tell how the game will turn out, but the concept sounds promising enough. The plainly named Star Trek - The Video Game focuses on cooperative action between the friends/rivals/subjects of much fan-fiction, Captain James T. Kirk and sidekick Mr. Spock, as they tackle "a familiar and lethal" enemy. During the course of the game, "Players will find themselves immersed in an epic adventure along with Kirk and Spock, crisscrossing the universe and its unexplored planets, encountering enemy battleships and utilizing the latest 23rd-century gear and weaponry." The developers have yet to reveal whether romancing green-skinned aliens or stopping fangirls' hearts with a raised eyebrow will factor into gameplay. Star Trek games and movie tie-in games both have mixed reputations, at best, so it's easy to see combining the two as tempting fate. However, an original story penned by Marianne Krawczyk (writer of most of the God of War games) and two co-writers of 2009's Star Trek could go a long way towards helping it stand out. The game isn't slated to come out until Spring 2013, so Namco Bandai - a proven developer for many different game genres - has plenty of time to make a game worthy of the franchise. History is not exactly on its side, however. For every Bridge Commander or Elite Force, there seem to be two or three D-A-Cs or Shattered Universes. For now, it's probably best to adopt a "wait-and-see" approach, and hope against hope that Spring 2013 will be a time to set phasers on "fun."